Send your best wishes with a delicious fortune cookie, covered in Belgian chocolate, then drizzled or decorated with your choice of toppings. The best part? Your personal message of glad tidings is printed on the 12" fortune inside! Giant Vanilla Fortune Cookie Dipped in Fine Belgian Chocolate. Hand Decorated with Royal Icing Decorations and Sprinkles. Your Personalized Fortune Inside Cookie. 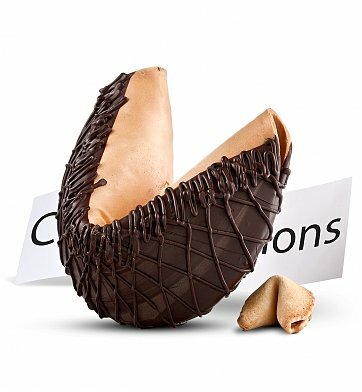 This premium fortune cookie is wrapped in French cellophane for freshness and accentuated with a hand-tied satin ribbon. Free Fortune Cookie Message! Enter your message using the personalization option during checkout. Maximum of four (4) lines, with up to 25 characters per line. Measures 6" x 6" x 6", Weighs 4 lbs. if ordered by 2:00 pm EDT Monday April 29th. Giant Fortune Cookie with Personalized Fortune is a hand delivered gift. These gifts are delivered by one of our local design centers located throughout the United States and Canada. Same day delivery is available for most gifts when ordered before the cutoff time. The cutoff time for Giant Fortune Cookie with Personalized Fortune is 11 AM in the recipient's time zone. 6 Inch, 4 lb. giant personalized fortune cookie, handmade in the USA. As seen in Better Homes & Gardens, InStyle Magazine. Arrives carefully wrapped to ensure safe transit and perfect presentation. Cookie was good size, and well presented. We personalized our fortune with cookie and this was unexpected and enjoyed by recipient. We purchased this for a friend, because it was something different, not just sending flowers or chocolates. The cookie is huge - takes two hands to hold it and she was delighted. It arrived perfectly on time and well wrapped with a lovely red bow. I would recommend and would also use GiftTree again. First time customer and I was very happy with the delivery communication. My son loved it and he said it tasted great. This cookie arrived in perfect condition and got a good laugh out of the recipient who loves Chinese food! This is one big cookie! While a creative idea, I was a bit disappointed in the actual fortune. It was just plain black ink on a long piece of white paper. I was hoping for something more dramatic that the person would want to keep. That being said it was a big hit at our bosses Birthday party. Gave this to my BF, for Valentines Day, as a different sweet treat! He loved it! My friend and I had this delivered to a friend who had just finished months of chemo for breast cancer. She loved it!!! In fact her whole family loved it! They waited until they were all together to crack it open and see what her fortune was. So fun! This gift is not only unique but fun too! The people I gave this too can't stop talking about it! They were ecstatic about it! They got to enjoy a delicious treat that was fantastic and get a personalized message in their fortune cookie! They loved it and I love it that they loved it! Great success! Well recieved and a new fun idea. You have to keep em guessing and this certainly will. The cookie was HUGE and the fortion inside a real bonus. It unwrapped to be very large as well about two-three feet! Great and original idea for an anniversary present. freakin delicious and unique gift! this was a huge hit, and its awesome because its a little something extra other than a card and flowers. Unique, thoughtful, and pretty! It was nicely packaged, arrived early, and looked (and tasted) like an actual fortune cookie:) Oh, & the icing (I chose the vanilla), it was delicious! I loved this HUGE fortune cookie gift. It was personalized to my likings. At first I thought the cookie was a bit expensive. But when I saw the actual size I realized I was wrong. It was beautiful made and my girlfriend really loves it!